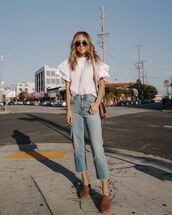 A white blouse is a firm fashion favorite as seen on Tumblr and for very good reason. It suits anybody, of any age, and can be dressed up with a pretty blazer and jeans, or down with a cute pair of shorts. 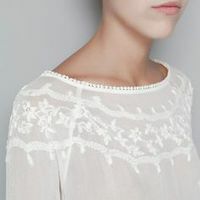 A blouse is loose fitting and was once worn by peasants and did not become part of the fashionable wardrobe until 1890. It became standard dress for the newly employed female working in an office. Nowadays it is still prevalent, though worn as either office or casual wear. For a girly look in the summer, try wearing a boho gypsy blouse with a maxi skirt. A white blouse should be a staple in every wardrobe.